In the late 1930’s in a small mountain village in Italy there lived a successful businessman everyone called The Don. The Don had a son who recently had become a father. He and his wife had a 4-month-old baby boy. One brisk fall day the Don, his son and the Don’s brother went on a hunting trip. Tragically on this trip the Uncle shot his nephew leaving the young wife and infant son. The story goes that the new mother suffered a broken heart and was unable to care for her baby. And so, Viola became a wet nurse. In exchange the Don gave Viola’s family beautiful vegetables from his large garden. So, Viola nursed the other two babies with her generosity of spirit and milk. Ten years later she gave birth to another boy, Anthony. In the 1950’s the family moved to Pennsylvania. Viola’s first grandchild, Maria’s son, Rob is my husband. I gave birth to Viola’s first great-grandchild, Phoebe. I struggled at first to nurse her but in a few days Phoebe and I got into a nice rhythm together. When Phoebe was 5 weeks old Rob and I took a road trip with our new baby to meet her great-grandmother. The trip took about three times longer than usual but we made it to Devon, Pennsylvania. Viola, now known as Nana, was ecstatic to meet Phoebe. When I nursed her for the first time in Nana’s presence Nana told me the story of having nursed the other babies. I could tell she was proud of me nursing. Nana loves that I nursed all of my children and that I help other moms nurse their babies. This week Nana turned 94. 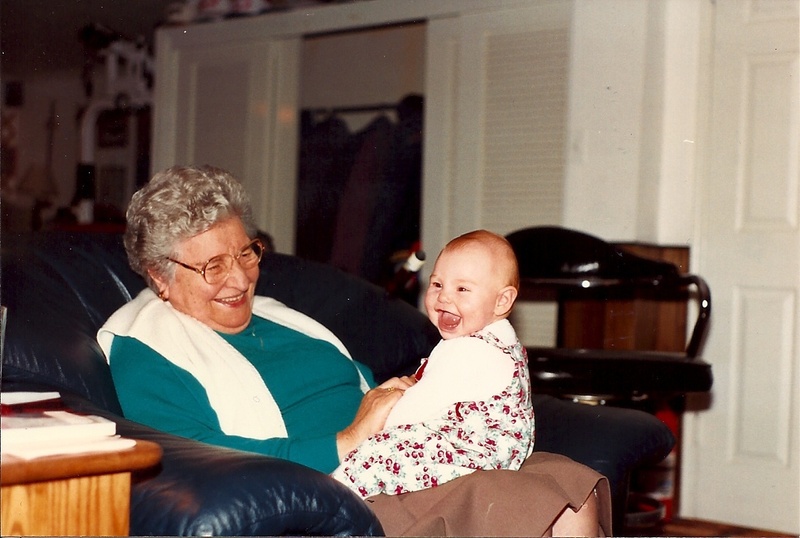 Here’s to you Nana – for being my champion, my role model! Very honored to have met Nana a while back… didn’t know this story about her! What a generous woman!